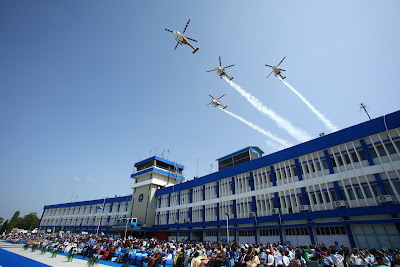 The blue skies of Air Force Academy turned vibrant with a colourful march-past by the passing out Cadets on the ground and amazing aerobatics in the air by various aircraft of Indian Air Force on Saturday, which marked the momentous occasion of the graduation of 113 Flight Cadets as Flying Officers of the Indian Air Force which included 13 women officers. 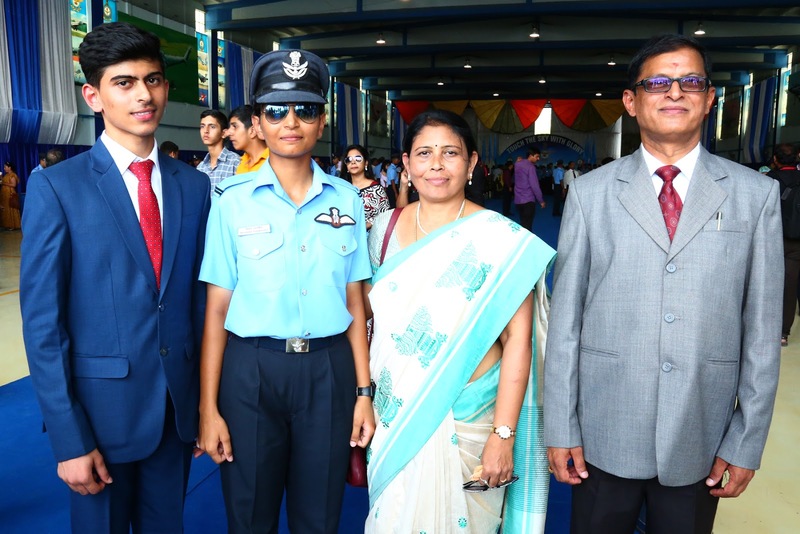 The ceremony also marked commissioning of another woman fighter pilot, Flying Officer Meghana Shanbough, in the IAF. 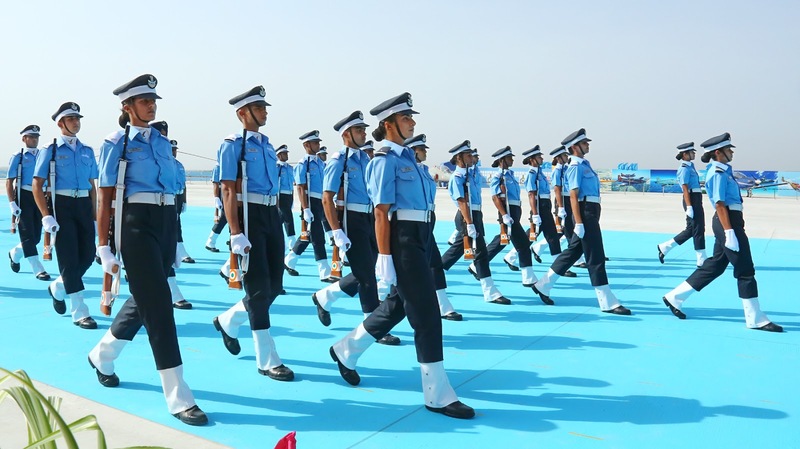 Air Chief Marshal Birender Singh Dhanoa, the Chief of Air Staff (CAS) graced the solemn ceremony as the Chief Guest and reviewed the Combined Graduation Parade. 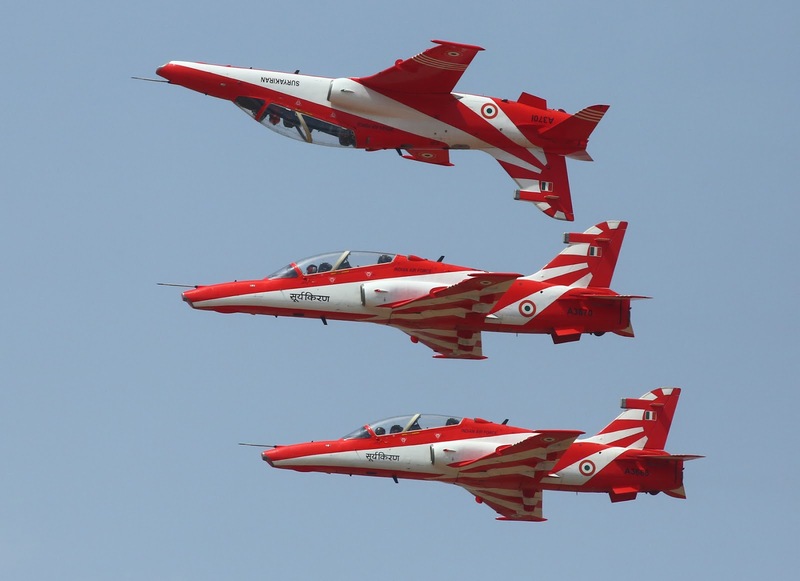 The Chief Guest was received by Air Marshal SRK Nair, Air Officer Commanding-in-Chief, Training Command and Air Marshal Amit Tiwari, Commandant Air Force Academy. 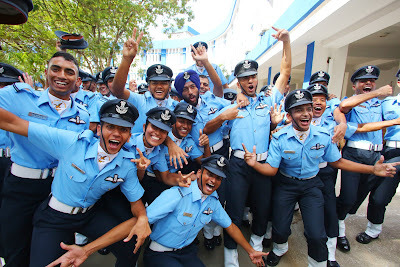 A total number of 113 Flight Cadets including 13 women cadets were commissioned as Flying Officers, at their alma-mater, the Air Force Academy, the ‘Cradle of IAF Leadership’ that has moulded generations of prodigious aviation leaders. It was also indeed a proud moment for 80 young pilots, 06 navigators and 27 ground duty officers who earned their coveted ‘Wings and Brevets’, along with 06 officers of Indian Navy and 05 officers of Indian Coast Guard on successful completion of their flying training. The CAS gave away various awards to the Flying Officers who had excelled in their training. Flying Officer Tarun Nair from the Flying branch was awarded President’s Plaque and the Chief of the Air Staff ‘Sword of Honour’ for standing first in Overall Merit in Pilot Course. Flying Officer Abhishek Bajpai and Flying Officer Banti were awarded President’s Plaque for being first in overall merit in Navigation and Ground Duty branches respectively. The grand event was witnessed by esteemed guests who included proud parents of the graduating trainees, various military and civilian dignitaries and few foreign Defence Attaches. The ceremony began with the sky diving by the ‘Akash Ganga’ Team, enthralling the spectators by dotting the skies of Dundigal with tri- colours and precise landing right in front of them in the parade square. 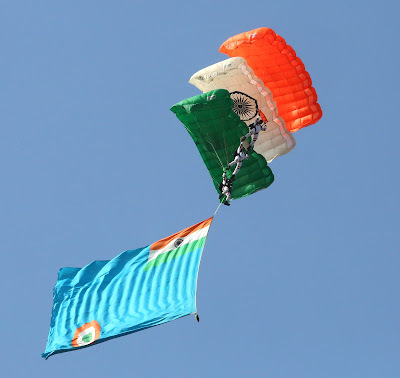 Spectators were held spellbound by the spectacular movements of the Air Warriors Drill Team, the ‘Nishan Toli’ marching-past with the ‘President’s Colours’ of the Academy and impressive Parade by the graduating trainees. 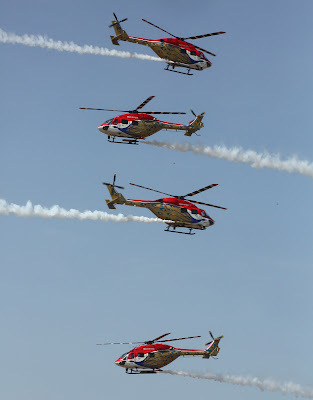 The spectators were awestruck by the breath-taking aerobatics of highly experienced and skilled pilots of Suryakiran Aerobatic team, ‘Sarang’ the Helicopter Aerobatics Team, and PC 7 MK-II of the IAF. The Reviewing Officer was accorded ceremonial salute by the Cadets followed by an impressive march past. The highpoint of the parade was the ‘Pipping Ceremony’. 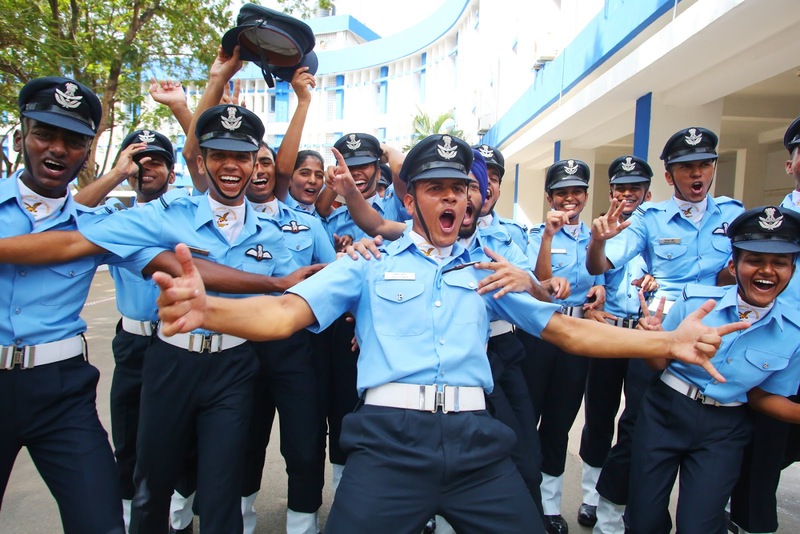 The Flight Cadets were awarded their ‘Stripes’ (Air Force rank) by the Chief Guest, the AOC-in-C Training Command and Commandant, Air Force Academy. They were then administered the ‘Oath of Service’ (the Pledge) by the Commandant of the Academy in the presence of the Chief Guest, Parents and other dignitaries. 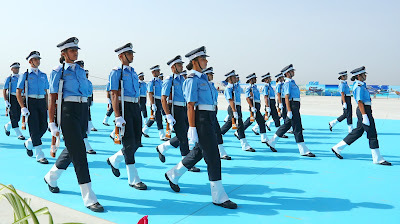 Later, addressing the Parade, the Chief of Air Staff complimented the newly Commissioned ‘Flying Officers’ for an exceptional standard of parade. 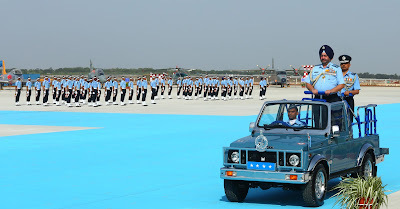 Congratulating the passing-out Cadets the Air Chief said, “It is a matter of pride and honour to review the Combined Graduation Parade and welcome the fine men and women into the Indian Air Force as Military Aviation leaders”. Keeping in view the changing geo-political and strategic environment and varied security challenges faced by India, he urged the young officers to remain in heightened state of preparedness by dynamically adapting to the continuously changing environment. While bringing out that our country is going through a transformational shift to continuously modernise its forces, he told them to widen their horizon and keep pace with the swiftly advancing technology to exploit the true potential of the Aerospace Power. He advised the Cadets to focus on the core values of the IAF- Mission, Integrity and Excellence and to be an inspiration for today’s young generation through selfless service and devotion to duty.He also reminded the Cadets that the task cut out for the Defence forces is painstakingly challenging one and the task of IAF is to defend our aerospace in addition to supporting the people by providing them succor in times of natural calamities. He told the newly commissioned officers that they must serve as role models to the men under their command and hence they must keep themselves mentally agile, physically fit and professionally updated. In conclusion, he exhorted the newly Commissioned Officers to constantly strive to improve their professional qualifications and expand skill levels failing which they will become outdated. All the Flight Cadets were imparted their initial basic training at AFA for six months (known as Stage–I) and subsequently undergo professional and advanced training at various Air Force Stations namely Hakimpet, Begumpet and Yelahanka besides AFA itself, based on their area of specialization, for another six months (known as Stage–II). After completion of both the stages of training, they re-assemble at Air Force Academy, Dundigal for the ‘Combined Graduation Parade’ from the portals of the majestic “Sekhon Block”, a landmark building named after Flying Officer Nirmaljit Singh Sekhon, Param Vir Chakra. The glittering ceremony culminated with the newly Commissioned Officers marching-out in two columns in slow march to the traditional notes of ‘Auld Lang Syne’, the poignant farewell tune played by Armed Forces of the world when bidding adieu to colleagues and comrades, proudly acknowledging the first salute given to them by their immediate juniors. 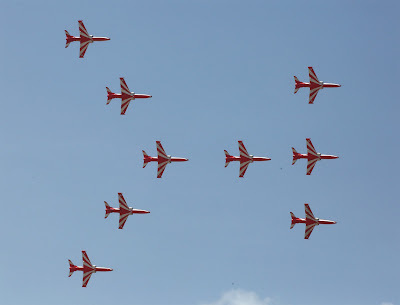 They marched in absolute synchrony and with purposeful strides as they saluted the Reviewing Officer and crossed through the portals of their alma mater to take-on their future assignments and challenges unstintingly to “Touch the Sky with Glory”. Chikmanglur is known for the finest coffee, beautiful nature and waterfalls. From now onwards, it would be known for giving India another woman fighter pilot, first from south of Vindhyas and also from the Karnataka. All other fine woman fighter pilots who were commissioned earlier in the IAF hailed from various states of MP, Rajasthan, Bihar and UP. 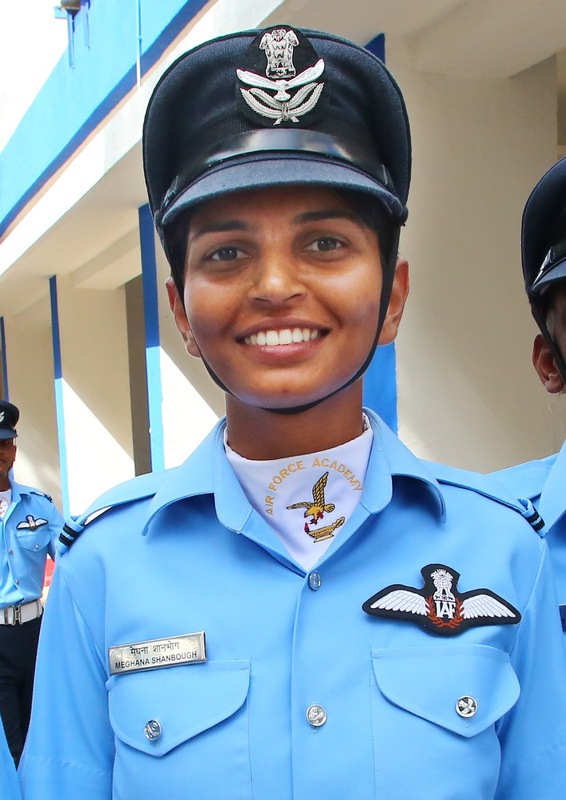 Flying Officer Meghana Shanbough was born in Chikmanglur in a family of lawyers. Her father Shri MK Ramesh is a practicing lawyer and mother Smt SC Shobha is presently serving as a judge in the District Consumer Forum, Udupi. She had her schooling at Little Rock Indian School a boarding school in Brahmavar, Udipi. She did engineering in Information Science and Engineering from Sri Jaya Chamarajendra College of Engineering, Mysore from 2011-15. After having joined in January 2017 in the Flying branch at Air Force Academy, she was cleared for flying in fighter stream in a trifurcation board in December 2017. She will be the sixth woman fighter pilot to be inducted in the IAF. After her graduation in 2015, she did basic mountaineering course form Manali and Para gliding at Goa during 2016, before joining IAF. In a daring and complex operation, a Seaking 42 C helicopter from the Eastern Naval Command winched down one MARCO officer on the ill-fated merchant vessel SSL KOLKATA which had been on fire since the last two days and abandoned by the 22 crew members on 14 Jun18 off the Sagar Island at the mouth of the Ganges Delta. The Marine Commando Officer ascertained the conditions in the forward part of the ship and later called in the helicopter to lower onbord three crew members of the ship. The team managed to drop the starboard anchor from the ship to prevent her from drifting any further. Thereafter the team prepared the seamanship gear for the ship to be towed if required. The LIVE nature of the threat was evident from the explosion onboard in the forenoon which restarted the fire. The helo skillfully recovered all four members of the team and is returning base for turnaround. Earlier, VAdm Karambir Singh , Flag Officer Commanding- in-Chief Eastern Naval Command had directed that the ship drift towards the Sundarbans delta had to be stopped at all costs notwithstanding the high temperatures onboard to avoid an ecological disaster should the ship capsize on the sandbanks causing pollution from oil on board. Accordingly, a Seaking 42C helicopter and a Dornier aircraft were despatched from Visakhapanam with a core team comprising divers, Marcos, shipwrights and seamanship specialists to stage through the IAF airbase at Kalaikonda. Simultaneously, the Naval Officer-in-charge West Bengal laised with the officials of the DG Shipping, ICG, KOPT, the ship owners, Agents and Salvage specialists at Kolkata and kept them informed of the plans. INS Kadmat which was exercising in the Bay of Bengal on 15 Jun 18 was directed to proceed at best speed and arrived on site at first light this morning ie 16 Jun 18 to augment the on site support wherein the ICG ships were also standing by. The operation this morning has successfully managed to arrest further drift of the ship to enable salvage operations by the company.